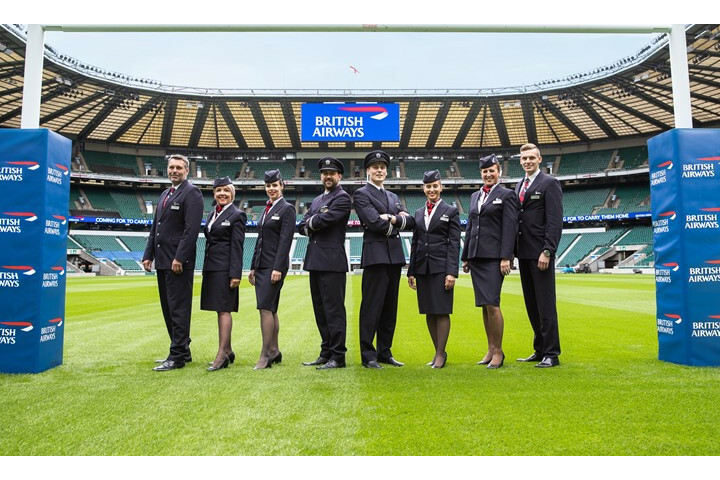 England Rugby and British Airways today announced a ground-breaking new partnership, which will see British Airways become the inaugural principal partner to Twickenham Stadium, as well as a principal partner and official airline partner to England Rugby. The new multi-year deal will see British Airways and England Rugby work closely together on the digital experience at Twickenham Stadium, including developing and launching a new stadium app and e-ticketing in the future. It also sees the new top floor facility of the redeveloped East Stand named as the British Airways Rose Garden, which will be a modern relaxed environment featuring live music and a mix of open cooking stations. As the principal stadium partner, British Airways will also benefit from exclusive stadium branding including the roof of Twickenham, visible from incoming British Airways flights into Heathrow Terminal 5. "A brand that has such a strong heritage that is aligned with our core values." "We are thrilled to announce our new partnership with British Airways and are extremely excited about working together," said RFU Chief Executive, Steve Brown. "Twickenham Stadium is the home of rugby and we're so pleased to have an iconic British brand as our first ever principal partner of the stadium. "We are proud to be working with British Airways, a brand that has such a strong heritage that is aligned with our core values." RFU Chief Commercial Officer, Simon Massie-Taylor, commented on the innovative nature of the partnership. "We are delighted to be working with British Airways and offering some new, engaging opportunities to rugby fans. "Collaboratively, we will be launching a new live digital content offering on match-days, 'British Airways Match-day Live', which will deliver fans at home some of the Twickenham experience. Our plans for the Twickenham app and digital ticketing are also very exciting." Alex Cruz, Chairman and CEO of British Airways, said: "We're getting behind England Rugby and looking forward to supporting the Men's and Women's squads, by delivering them ready to win on their travels all over the world. "Twickenham Stadium also sits on the flight path in to Heathrow, so our partnership with the home of England Rugby will be visible to British Airways customers from the skies." British Airways will also be flying the England men's and women's teams around the world, including to Rugby World Cup 2019 in Japan and Women's Rugby World Cup in 2021. The partnership will also bring exclusive memorable experiences to our fans and British Airways' customers, including the chance to join the England men's team on a summer Test series.